Are you looking to have some entertainment at your home? Well, what could be better than playing a game of pool with your family members and other near and dear ones. And the game is better when you have a standardized, easy to use, foldable pool table from Bello Games New York. Bello Games has been in the market for quite long and are well-known for providing family games and accessories and that too, at reasonable prices. And the Deluxe Folding Pool Table EXTRA LARGE 44″ is undoubtedly one of those products that will be a prized possession of your house. The Deluxe Folding Pool Table brings in a number of incredible features along with excellent specs that will make any pool lover go gaga over this table. This is a small table when compared to the professional standards. The legs of the table are foldable. Use of cherry wood makes the finishing superb. When folded, the table becomes 4 ½ inch in height. Includes super speed cushions as you would find in professional tables. Comes with cue sticks (2), a ball set, one diamond triangle to store the balls, a table brush (9 inches), a chalk for the table. The first and the foremost thing is the size of the table. It is a portable pool table and hence whether you live in a small apartment or have a small playroom or have other games in your playroom, you can easily fit this in. This ensures that this folding game table is an ideal product for all family who want to bond over a game of pool. The next thing that will advantageous to the buyers will be the fact that the legs of the table are foldable. With the facility to fold the legs, you can just tuck it away wherever you want, under the bed or in the attic and elsewhere as well. So, if you have a space crunch and do not want the table to make things crampy, then this is the one for you. With the legs being foldable, the table is also ideal for those who have to relocate often due to their job or other reasons. You just have to fold the legs and carry it off with other items. The materials used in making the table as well as the pockets and the top are of superb quality and can withstand for years. The legs being sturdy ensure that they do not give way or become wobbly after some months of use. The no setup facility is another advantage of this fold-up table from Bello Games New York. No effort at all. Just bring it home and start playing. All the accessories needed for the game are provided. So you can start playing immediately. The table doesn’t come with any levelers. So, if the floor isn’t perfectly level, you will have to buy levelers yourselves. Moreover, this is a small table and if you want to practice and play professionally, then this table is not for you. Most people who have bought this table have been much satisfied with its performance. It is true that it doesn’t come with levelers and is small in size but it makes that up by providing an excellent gameplay and the opportunity to play, practically anywhere. 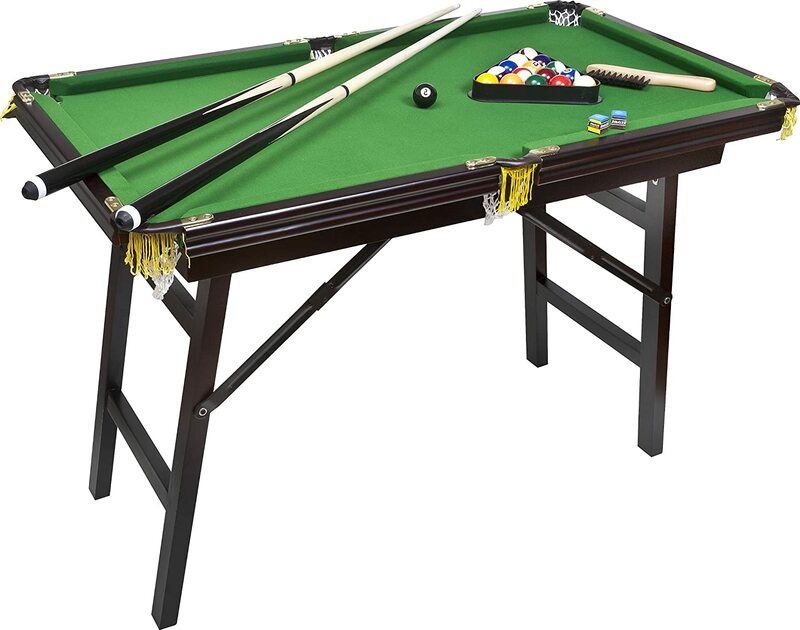 So, if you want a portable pool table that will offer excellent performance for years to come and give you a perfect way to spend time with your friends and family, be sure to buy this folding game table from Bello Games New York.